This week’s pick is the versatile Multipurpose Picture Schedule. All classrooms – especially those with young learners – incorporate various visual schedules to structure an activity or the day’s events. 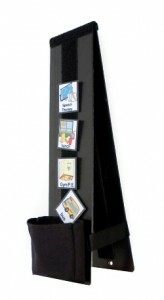 This communication board can be self-standing, used on a table top or hung on a wall. There are 2″ of loop-side fabric on both sides to make all sides usable. You can prearrange your symbols and store extras on the back to ease quick transitions. The board measures 4″ x 33″ when opened. (*Note: the picture symbols are not included). This week only, save 15% on the Multipurpose Picture Schedule by entering the Promo Code BLOGMPP7 at checkout. *Offer expires on October 30, 2012 at 11:59 pm EST. Not compatible with any other offer. Be sure there are no spaces after the Promo Code when you enter it at checkout. Written by: Different Roads to Learning on October 23, 2012. This entry was posted in ABA, Difflearn Promo Code, Pick of the Week, Sale, Transitions and tagged ABA, Applied Behavior Analysis, autism education, daily routines, schedules, special needs, teaching tools, transitions, visual cues, visual supports by Different Roads to Learning. Bookmark the permalink.